No contract, easy to setup. One less worry for you! We are now offering automatic delivery. Contact us today to find out how you can rest easy this winter knowing we are monitoring your tank for you! WiFi tank monitors take the guesswork out of deliveries. It takes ultrasonic readings of the fuel level in your oil tank and sends those readings to our ofﬁce over the internet. With this precision, we can ensure that you get exactly the fuel you need, when you need it. We want you to be 100% CONFIDENT you will not run out of fuel and give you a greater connection to your comfort. The easy to install app, available for both IOS & Android, gives you instant access to information you never had before. You’ll be able to see how much fuel you have in your tank, any time, from anywhere. You’ll see how much heating oil you’ve been burning over the last 30 days. 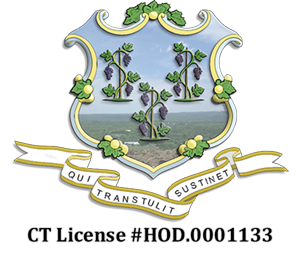 You’ll be able to call or email us, or go to our website, just by tapping an icon on your smartphone or tablet. The installation is done by our technicians in just a few minutes. Our technician attaches the tank monitor to your tank and connects it to your home WiFi network. Never worry about running out of fuel again! 100% accurate readings to ensure timely deliveries and prevent run outs. The app also provides daily usage statistics to help you track how much oil you are using. Easily installed by our technicians in roughly 10-15 minutes. The app is available for both Apple & Android devices. 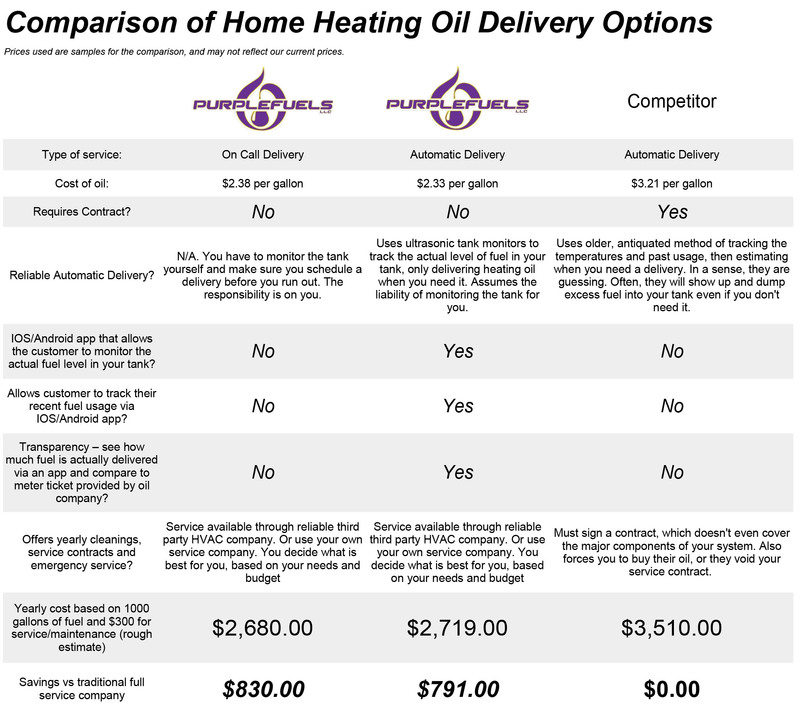 Customers on automatic delivery for heating oil SAVE $.05 a gallon off our listed rates. Saving 5 cents a gallon will add up over the course of a cold winter! No long-term commitment. Cancel any time. A one-time fee of $89 is all it takes to receive the best service at the best price! An emergency bleed and restart, no matter the time of day or night. A 2-year complimentary service contract. 100 gallons of home heating oil. Up to $25,000.00 of damage protection. Customers may cancel automatic delivery at any time without fee or penalty. Arrangements must be made to return our tank monitoring equipment. What does the oil tank monitor do? The tank monitor takes ultrasonic readings of the fuel level in your tank and sends those readings over the internet to us. With this precision, we can ensure that you get exactly the fuel you need when you need it. A one-time fee of $89 is all it takes to receive the best service at the best price! You will receive a $0.05 discount on the price of fuel, so depending on how much fuel you use, using our monitor will pay for itself in no time! We will fill your tank when it is between 1/4 & 1/8th. This is based on a standard 275 gallon tank. During periods of inclement weather it will most likely be closer to 1/4 than 1/8th. Why are you installing one? We want you to feel CONFIDENT you will not run out of fuel. The tank monitor also comes with a smart phone app that gives you information you never had before. You’ll be able to see how much fuel you have in your tank, anytime, from anywhere. You’ll see how much you’ve been using and when your next delivery is scheduled. You’ll be able to reach us with the tap of an icon. It’s one more thing that sets us apart from a typical fuel company. How will the tank monitor be installed? For the monitor to work, it needs to send its data over the internet via your home WiFi (If you do not have functioning WiFi, it will not work.) At your home, our tech will use a Smartphone App to confirm that the monitor will connect to your WiFi from your tank. He will then screw the monitor into a spare opening on the fuel tank, and activate the monitor. That process should take 10 minutes or less. How will it connect to my WiFi network? The technician will ask you to enter your WiFi password into the monitor installation app. (just like when you get a new computer, phone, Kindle, etc.) He will check to see that the password worked and that the monitor is connected to the internet. Please have your WiFi password available for our tech when he comes to your home. How far from my router can the tank monitor be installed? As you know, WiFi signal strength can vary from 100 feet to 300 feet. Our technician will tell you if there is a problem with connectivity. How do I download the Smartphone App? After the monitor is installed, you can download the Tank Monitor App either from the Apple Store (iPhones and IPads), or Google Play (Androids.) There’s a short video on YouTube that will show you how to set it up—it’s easy! Just enter this link into your browser: https://youtu.be/0VvwOVSR0rI. Is my WiFi information safe? Yes. The password will be entered by you into the installation app. The WiFi information is encrypted and stored inside the monitor itself, and is NEVER stored elsewhere. It does not connect to any of your other devices. Will the tank monitor impact my network speed? No, it won’t. The fuel level data being sent each day is tiny. Who owns the tank monitor? The monitor is property of PurpleFuels. If you discontinue doing business with us for any reason, we will need the equipment returned to avoid being charged. What happens in a power outage or internet outage? The monitor will not connect to the router if the router is off or there is no internet access. The readings are stored, and the monitor will keep attempting to connect. You normally do not need to reset the device. In the rare case of a prolonged outage, we will make the necessary arrangements to ensure you have the fuel you need. What happens if I change the WiFi password on my router, or get a new router? You will need to reconnect it using your Smartphone App. On the menu in the top left corner, tap “WiFi” and follow the instructions. It is easy to do, but please call us if you run into difficulty. Does the monitor work on every tank? The monitors will work on most internal and external tanks. They will not work on in-ground tanks. Please contact us if you are unsure about whether it will work in your situation. When do I receive the $0.05 per gallon discount? You receive the discount on your first delivery that is triggered by the monitor. Once you have the monitor installed, and it hits the predetermined level for a fill, then we come out and deliver and you receive the discount on that delivery. Contact us today to get started on automatic delivery and we will reach out to you to setup a date/time to install your tank monitor.